How well do education interventions work? 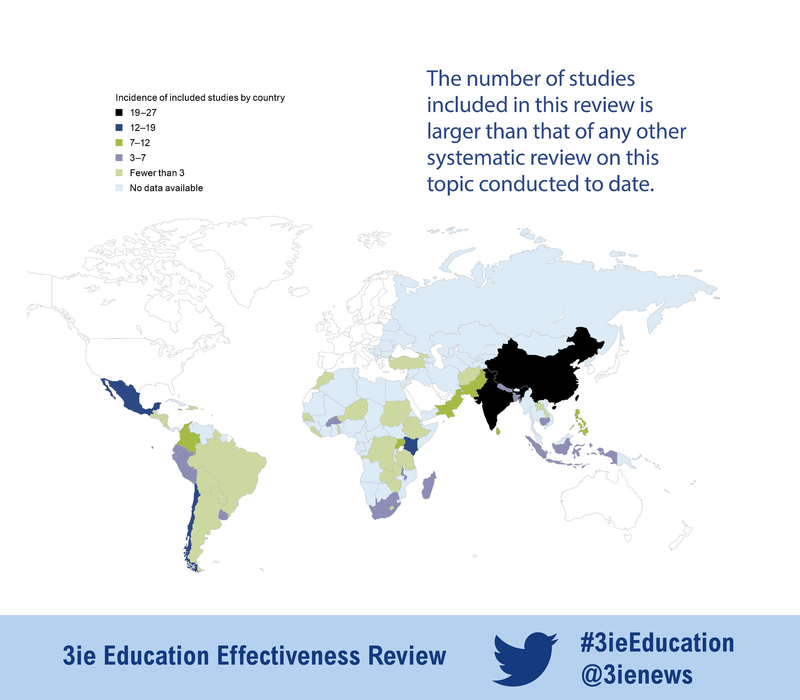 The International Initiative for Impact Evaluation (3ie) set out to answer this question when it embarked on a comprehensive systematic review conducted on education effectiveness. 3ie shared its findings during the IIEP Strategic Debate held on 20 October 2016. Around 250 million children in low-and middle-income countries (L&MICs) cannot read, write or do basic maths. 263 million children are out of school, and 300 million children in school are not learning. 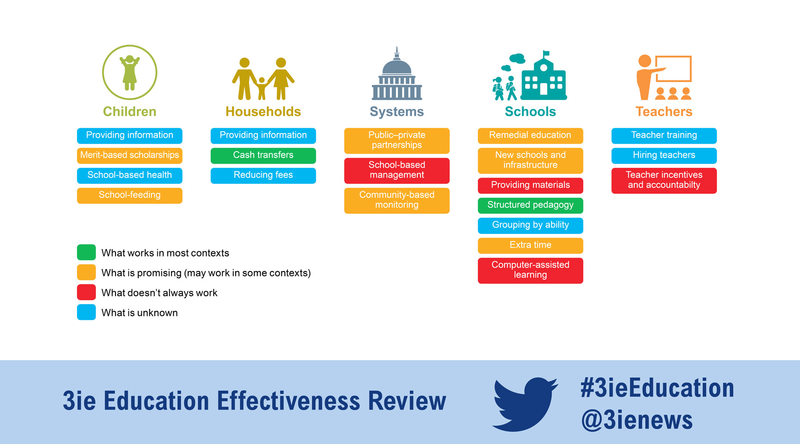 A range of different education interventions have been implemented to resolve these and other educational issues, and 3ie set out to examine the efficacy of these measures. 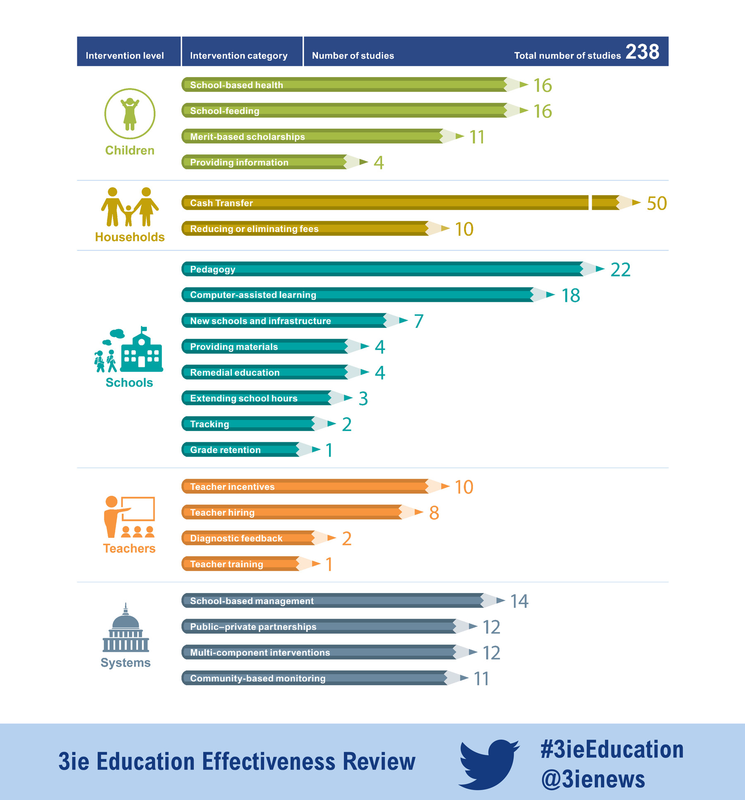 In the most comprehensive systematic review conducted to date on education effectiveness, the 3ie review examined the impact of 216 education programmes in 52 L&MICs. The report is called “The impact of education programmes on learning and school participation in low- and middle-income countries”. It aims to offer governments and international agencies ideas on how to identify effective education programmes to meet the education Sustainable Development Goal. This comes at a time when education aid is dwindling. As the report states, the Global Partnership for Education estimates that aid for basic education fell by almost eight per cent between 2010 and 2013 (GPE 2016). At the start of the debate Richard Manning, President of the Board of Commissioners (3ie) said that this review offers a timely synthesis of the available evidence. He also emphasized how important it is for 3ie to share their findings with IIEP and UNESCO. “This evidence is by no means as substantial as it should be, but it is a very important aspect of our operations to bring this review under the attention of policy makers,” said Manning. Birte Snilstveit, Senior Evaluation Specialist at 3ie led the review. She and her team scrutinized 2000 papers to gather evidence on the effects of 21 different types of education interventions like children’s school enrolment, attendance, completion and learning. The studies were conducted in 52 countries, mainly focused in Latin America and sub-Saharan Africa. One of the key findings of the review is that programmes typically improve either school participation or learning outcomes, but not both. Cash transfers are most effective in improving school participation, while merit-based scholarships have been more successful in improving learning outcomes. However in the case of community-based monitoring, school-feeding and multi-component interventions, these programmes have shown to improve both school participation and learning outcomes in certain contexts. Further evidence from the report showed that programmes using structured pedagogy to change the classroom environment had the largest and most consistent positive effects on learning of any programme included in the review. Some surprising findings were that often there was no clear improvement to learning outcomes with more textbooks. This can be explained when textbooks are not appropriate to the children’s level. Also, computer-assisted learning sometimes had negative effects on learning because the children weren’t trained properly to use them. During the debate Sniltstveit went on to say that when thinking about the design of educational programmes, it is important to take into account the barriers that prevent children from learning. “We need programmes that address multiple barriers at the same time. Programmes must be tailored to the local context and capacity of education systems to implement them,” she said. Aaron Benavot, the Director of the Global Education Monitoring Report was one of the speakers at the debate. He reacted to the review findings by emphasizing the need to discern which interventions and programmes are most cost-effective, specifically to aid policy makers' choices. “If we want to make smart education investment decisions we need information on value for money per intervention,” Benavot said. Several discussants that took part in the debate underlined the importance of taking local context into account when applying the review findings. Sniltstveit agreed, saying that the review is tailored for global agencies and requires precise interpretation at country and community level. This debate formed part of the IIEP Strategic Debate series on the Education 2030 agenda.